How many bikes is the perfect number? In tough economic times when people are simply working hard to make ends meet, the answer to this question is simple: One. One bike as long as it runs is enough to improve my life by orders of magnitude. But let’s say for a moment that money is not the biggest concern. You can afford to buy the bikes and somehow you can afford the maintenance (either done yourself or at a local shop). Now, how many bikes do you really NEED to amass the perfect stable of roaring equines? Years ago I read an article on this very topic by a famous Cycle World writer by the name of Peter Egan. Egan rode a lot of sport and sport touring bikes (Vincents, Hondas and a host of others), so despite his incredible writing style, his opinions may not be aligned with the readers (or frankly writers) of this magazine. Let’s get the easy one out of the way – you need a bagger: Most would say that a good, hearty touring bagger such as a Road glide or Street Glide with moderate modification would be the go-to bike for long hauls and even for extended weekend riding. There is something to be said for the bike that starts when you ask and rides across endless states without so much as a hiccup. The radio is audible and the Bagger looks good enough to feel some pride on the highways. The shocks are upgraded, the pipe has a non-stock rumble and the bars are more ergonomic than the stock offering from the MoCo. 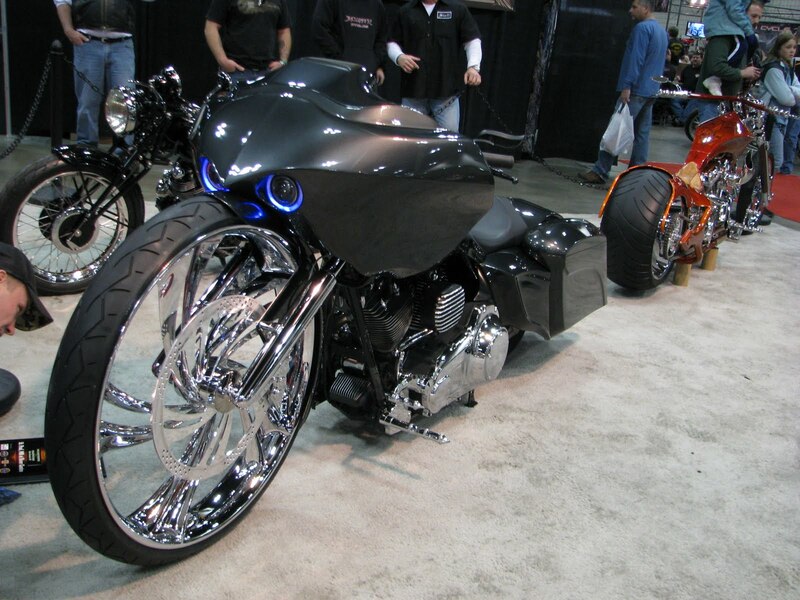 A show bagger: Beautiful baggers can be ridden, we’ve covered that, the question is if you want to take the pristine pony out in the roughest conditions? Look back at our three rides through hailstorms last year. Hail is rough on paint – do you want your $15k paint job exposed to golf balls from heaven? With this said, what’s better than pulling up to Café Vittoria in the North End on a pimpin’ bagger and having a random Swedish girl ask for her picture on your bike? Nothing! Nothing is better than that! (unless you are still single and she asks to go for a ride, but I neither have that much game nor freedom to pull it off). Pay homage to the days of the past and you need something with a sweet springer front end. This can also be your wrenching bike if you end up with a Knuckle or Panhead. There is beauty in the past and reward in simplicity. A leisurely Sunday ride through North Conway on a 1947 Harley Davidson EL with a Knucklehead motor thudding under your seat as you catch the last curves before stopping for a beer at Horsefeathers is not a bad way to spend a day. Taking this bike on the Kancamangus Highway may not be the best idea, but the bike will give you more appreciation of a simple ride though country roads and covered bridges of rural Vermont. Still, some of us like to go fast. You may not want to buy a Japanese bike but may be able to find an old Duck that will serve the purpose. I think this one is optional but a better idea than taking your everyday bagger on the track or trying to fill that need for speed on Rt 3A. You can never get the bike up fast enough to replace the adrenalin of a track day. This one is the only one that (with enough funds) is not an option. As we travel around the country we meet a lot of great people. All of them want to visit Beantown and ride. Some will ride here like our friends in Utah have frequently threatened. But many more want to spend a few days riding New England roads without taking two weeks off work. The spare bagger can cover this need. I’ve heard arguments that a dirt-bike is needed or a sport-touring bike could be desired but I don’t go for that. Not everybody’s tastes are the same and you may not ever want to leave the comfort of paved roads. Would it be nice to have a full motorcycle museum similar to Jay Leno’s Cliffside home? Sure – who would hate that? The problem is maintenance and really enjoying the multitude of bikes titled under your name. It takes time to maintain bikes and even if you ride a lot, one would have to assume that there is difficulty in a rotation more than a handful of bikes. Interestingly enough, Peter Egan came up with the same number of five bikes being the perfect number of bikes while eliminating cost as a consideration. As we mentioned above, his bike choices were different and less altruistic (he didn’t allocate one to a bike-less friend) but the result was the same. More than five bikes and it may become a hardship to maintain, taking a toll on ownership. What do you think – how many bikes is optimal and what would they be?